[The International Monetary Fund (IMF) was] brought in by the London and New York banks to enforce [third world] debt repayment and act as "debt policeman." Public spending for health, education and welfare in debtor countries was slashed, following IMF orders to ensure that the banks got timely debt service on their petrodollars. The banks also brought pressure on the U.S. government to bail them out from the consequences of their imprudent loans, using taxpayer money and U.S. assets to do it. The results were austerity measures for Third World countries and taxation for American workers to provide welfare for the banks. Why did Mexico need to go into debt to foreign lenders? It had its own oil in abundance. It had accepted development loans earlier, but it had largely paid them off. The problem for Mexico was that it was one of those intrepid countries that had declined to let its national currency float. Mexico's dollar reserves were exhausted by speculative raids in the 1980s, forcing it to borrow just to defend the value of the peso. According to Henry Liu, writing in The Asia Times Mexico's mistake was in keeping its currency freely convertible into dollars, requiring it to keep enough dollar reserves to buy back the pesos of anyone wanting to sell. When those reserves ran out, it had to borrow dollars on the international market just to maintain its currency peg. In 1982, President Portillo warned of "hidden foreign interests" that were trying to destabilize Mexico through panic rumors, causing capital flight out of the country. Speculators were cashing in their pesos for dollars and depleting the government's dollar reserves in anticipation that the peso would have to be devalued. In an attempt to stem the capital flight, the government cracked under the pressure and did devalue the peso; but while the currency immediately lost 30 percent of its value, the devastating wave of speculation continued. Mexico was characterized as a "high-risk country," leading international lenders to decline to roll over their loans. Caught by peso devaluation, capital flight, and lender refusal to roll over its debt, the country faced economic chaos. At the General Assembly of the United Nations, President Portillo called on the nations of the world to prevent a "regression into the Dark Ages" precipitated by the unbearably high interest rates of the global bankers. In an attempt to stabilize the situation, the President took the bold move of taking charge of the banks. The Bank of Mexico and the country's fm-o" private banks were taken over by the governments with compensation to their private owners. It was the sort of move calculated to set off alarm bells for the international banking cartel. A global movement to nationalize the banks could destroy their whole economic empire. They wanted the banks privatized and under their control. The U.S. Secretary of State was then George Shultz, a major player in the 1971 unpegging of the dollar from gold. He responded with a plan to save the Wall Street banking empire by having the IMF act as debt policeman. Henry Kissinger's consultancy firm was called in to design the program. The result, says Engdahl, was "the most concerted organized looting operation in modern history," carrying "the most onerous debt collection terms since the Versailles reparations process of the early 1920s," the debt repayment plan blamed for propelling Germany into World War II. Mexico's state-owned banks were returned to private ownership , but they were sold strictly to domestic Mexican purchasers. 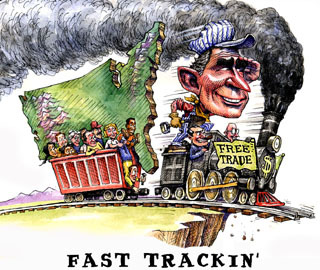 Not until the North American Free Trade Agreement (NAFTA) was foreign competition even partially allowed. Signed by Canada, Mexico and the United States, NAFTA established a "free-trade" zone in North America to take effect on January 1, 1994. In entering the agreement, Carlos Salinas, the outgoing Mexican President, broke with decades of Mexican policy of high tariffs to protect state-owned industry from competition by U.S. corporations. By 1994, Mexico had restored its standing with investors. It had balanced budget, a growth rate of over three percent, and a stock market that was up five-fold. In February 1995, Jane Ingraham wrote in The New American that Mexico's fiscal policy was in some respects "superior and saner than our own wildly spendthrift Washington circus." Mexico received enormous amounts of foreign investment, after being singled out as the most promising and safest of Latin American markets. Investors were therefore shocked and surprised when newly-elected President Ernesto Zedillo suddenly announced a 13 percent devaluation of the peso, since there seemed no valid reason for the move. The following day, Zedillo allowed the formerly managed peso to float freely against the dollar. The peso immediately plunged by 39 percent. What was going on? In 1994, the U.S. Congressional Budget Office Report on NAFTA had diagnosed the peso as "overvalued" by 20 percent. The Mexican government was advised to unpeg the currency and let it float, allowing it to fall naturally to its "true" level. The theory was that it would fall by only 20 percent; but that is not what happened. Speculators pushed the peso down sharply and abruptly, collapsing its value. The collapse was blamed on the lack of "investor confidence" due to Mexico's negative trade balance; but as Ingraham observes, investor confidence was quite high immediately before the collapse. If a negative trade balance is what sends a currency into massive devaluation and hyperinflation, the U.S. dollar itself should have been driven there long ago. By 2001, U.S. public and private debt totaled ten times the debt of all Third World countries combined. Although the peso's collapse was supposedly unanticipated, over 4 billion U.S. dollars suddenly and mysteriously left Mexico in the 20 days before it occurred. Six months later, this money had twice the Mexican purchasing power it had earlier. Later commentators maintained that lead investors with inside information precipitated the stampede out of the peso. The suspicion was that these investors were the same parties who profited from the Mexican bailout that followed. When Mexico's banks ran out of dollars to pay off its creditors (which were largely U.S. banks), the U.S. government stepped in with U.S. tax dollars. The Mexican bailout was engineered by Robert Rubin, who headed the investment bank Goldman Sachs before he became U.S. Treasury Secretary. Goldman Sachs was then heavily invested in short-term dollar-denominated Mexican bonds. The bailout was arranged the day of Rubin's appointment. The money provided by U.S. taxpayers did not go to Mexico but went straight into the vaults of Goldman Sachs, Morgan Stanley, and other big American lenders whose risky loans were on the line. There was a big party at Morgan Stanley after the Mexican peso devaluation, people from all over Wall Street came, they drank champagne and smoked cigars arid congratulated themselves on how they pulled it off and they made a fortune. These people are pirates, international pirates. The loot was more than just the profits of gamblers who had bet the right way. The pirates actually got control of Mexico's banks. NAFTA rules had already opened the nationalized Mexican banking system to a number of U.S. banks, with Mexican licenses being granted to 18 big foreign banks and 16 brokers including Goldman Sachs. But these banks could bring in no more than 20 percent of the system's total capital, limiting their market share in loans and securities holdings." By 2004, this limitation had been removed. All but one of Mexico's major banks had been sold to foreign banks, which gained total access to the formerly closed Mexican banking market. The austerity measures that the U.S. government and the IMF forced on Mexicans in the aftermath of last winter's assault on the peso by short-sellers in the foreign exchange markets have been something to behold. Almost overnight, the Mexican people have had to endure dramatic cuts in government spending; a sharp hike in regressive sales taxes; at least one million layoffs (a conservative estimate); a spike in interest rates so pronounced as to render their debts unserviceable ... a collapse in consumer spending on the order of 25 percent by mid-year; and, in brief, a 10.5 percent contraction in overall economic activity during the second quarter, with more of the same sure to follow. By 1995, Mexico's foreign debt was more than twice the country's total debt payment for the previous century and a half. Per-capita income had fallen by almost a third from a year earlier, and Mexican purchasing power had fallen by well over 50 percent." Mexico was propelled into a crippling national depression that has lasted for over a decade. As in the U.S. depression of the 1930s, the actual value of Mexican businesses and assets did not change during this speculator-induced crisis. What changed was simply that currency had been sucked out of the economy by investors stampeding to get out of the Mexican stock market, leaving insufficient money in circulation to pay workers, buy raw materials, finance loans, and operate the country. It was further evidence that when short-selling is allowed, currencies are driven into hyperinflation not by the market mechanism of "supply and demand" but by the concerted action of currency speculators.